Create your most radiant complexion yet with the Elemental Herbology Three Step Facial, a trio of skincare saviours to help you create a spa experience within your home. 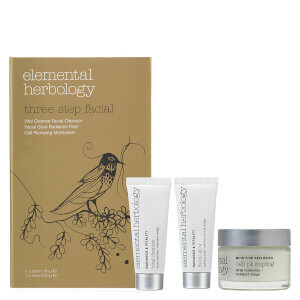 Containing a cleanser, peel and moisturiser, the gift set reveals youthful and glowing results. Formulated with 10% Manuka Honey to help minimise breakouts and brighten skin, while exfoliating Papaya Extract diminishes dead skin cells and works to minimise the appearance of fine lines and wrinkles. Infused with antioxidant Green Tea, the cleanser protects skin from environmental damage so you can experience a healthy-looking, refreshed complexion with a natural glow. Infused with a rich cocktail of vitamins and botanicals, this resurfacing peel heals skin which has been overexposed to the elements such as sun, central heating, wind, cold, flying and pollution, which all can result in dry, ageing skin. Blended with a tropical cocktail of vitamins, enzymes and skin-brightening botanicals to help exfoliate dead surface cells, stimulate cell metabolism and harmonise the skin tone to create a healthy complexion. Plump, hydrate and repair dry and mature skin with a hydrator enriched with marine actives and botanicals to promote a healthy and radiant complexion. The age-defying formula combines antioxidants, marine actives and hydrating botanicals to help protect against the elements and reactivate pro-collagen synthesis to leave you with a youthful, glow. Cleanser: Massage into damp skin and remove with warm water. Peel: Apply peel to clean, damp skin from neck to forehead. Do not scrub. Leave for 4 minutes. Remove with a face cloth soaked in warm water. Moisturiser: Massage into clean, dry skin. Cleanser: Aqua*, Mel (Manuka Honey)*, Glycerin*, Polyglyceryl-4 Caprate*, Cocamidopropyl Betaine*, Xanthan Gum*, Sodium Lauroyl Sarcosinate, Camellia Sinensis Leaf Extract*, Pyrus Malus Fruit Extract*, Pectin*, Chlorella Vulgaris/Lupinus Albus Protein Ferment*, Xylitylglucoside*, Anhydroxylitol*, Xylitol*, Ascorbic Acid*, Malic acid*, Maltodextrin*, Malpighia Glabra Fruit Extract*, Carica Papaya Fruit Extract*, Caprylyl/Capryl Wheat Bran/Straw Glycosides*, Fusel Wheat Bran/Straw Glycosides*, Citrus Nobilis Peel Oil*, Citrus Paradisi Peel Oil*, Pelargonium Graveolens Flower Oil*, Polyglyceryl-5 Oleate*, Sodium Cocoyl Glutamate*, Glyceryl Caprylate*, Hippophae Rhamnoides Oil*, Helianthus Annuus Seed Oil*, Rosmarinus Officinalis Leaf Extract*, Citric Acid*, Sodium Benzoate*, Potassium Sorbate*, Phenoxyethanol Benzoic Acid Dehydroacetic Acid, Ethylhexylglycerin Citronellol*, Geraniol*, Linalool*, Citral*, Limonene*. *Ingredients derived from 100% natural source. Peel: Aqua*, Theobroma Cacao (Cocoa) Seed Butter*, Hydrogenated Jojoba Beads*, Cetearyl Alcohol*, Caprylic/Capric Triglyceride*, Saccharomyces/Xylinum Black Tea Ferment*, Macadamia Ternifolia Seed Oil*, Olea Europaea (Olive) Fruit Oil*, Myristyl Myristate, Glyceryl Stearate*, Peg-100 Stearate*, Argania Spinosa Kernel Oil*, Cetearyl Glucoside*, Pearl Powder*, Carica Papaya Fruit Juice*, Mel (Manuka Honey)*, Sodium Palmitoyl Proline*, Nymphaea Alba Flower Extract*, Zinc Gluconate*, Magnesium Aspartate*, Copper Gluconate*, Citrus Aurantium Dulcis (Orange) Peel Oil*, Laminaria Digitata Powder*, Camellia Sinensis Leaf Extract*, Punica Granatum Extract*, Sodium Hyaluronate, Sea Salt*, Diacetyl Boldine, Glycerin*, Pyrus Malus (Apple) Fruit Extract*, Xylitlyglucoside*, Anhydroxylitol*, Xylitol*, Tocopheryl Acetate (Vitamin E), Magnesium Ascorbyl Phosphate, Retinyl Palmitate (Vitamin A), Lecithin, Citrus Tangerina (Tangerine) Peel Oil*, Malpighia Punicifolia (Acerola) Fruit Extract*, Malic Acid*, Glycolic Acid*, Lactic Acid*, Citric Acid*, Triethanolamine, Hydroxyethylcellulose, Guar Hydroxypropyltrimonium Chloride, Benzophenone-4, Alcohol Denat, Propylene Glycol, Disodium Edta, Ethylhexylglycerin, Phenoxyethanol, Potassium Sorbate, Limonene*. Moisturiser: Rosa Damascena Flower Water*, Aqua*, Dimethicone, Ethylhexyl Methoxycinnamate (Spf 8), Theobroma Cacao (Cocoa) Seed Butter*, Argania Spinosa Kernel Oil*, Cetearyl Alcohol*, Ceteareth-6 Olivate*, Butyl Methoxydibenzoylmethane, Glyceryl Stearate*, Glycerin*, Plukenetia Volubilis (Sacha Inchi) Oil*, Rosa Canina Seed Oil*, Panthenol (Vitamin B3), Soluble Collagen*, Pearl Powder*, Ubiquinone, Royal Jelly*, Oenothera Biennis (Evening Primrose) Oil*, Avena Strigosa Seed Extract*, Paniceum Milliaceum (Millet) Seed Extract*, Malpighia Glabra (Acerola) Fruit Extract*, Lecithin*, Retinyl Palmitate (Vitamin A), Peg-100 Stearate*, Cetearyl Glucoside*, Pelargonium Graveolens Flower Oil*, Oryzanol*, Arginine*, Maris Sal*, Tocopheryl Acetate (Vitamin E), Disodium Edta, Maltodextrin*, Ethylhexylglycerin, Tannic Acid*, Phenoxyethanol, Potassium Sorbate, Citral*, Citronellol*, Geraniol*, Limonene*, Linalool*.